Bivalirudin, a direct thrombin inhibitor, is indicated for patients with suspected heparin-induced thrombocytopenia (HIT) with anticipated percutaneous coronary intervention (PCI). Data is limited on dose selection among patients with renal insufficiency, particularly with prolonged infusion durations. The study cohort comprised 73 patients with renal dysfunction who received bivalirudin for suspected HIT with or without acute coronary syndrome. We reviewed individual pharmacy and medical records for laboratory and bivalirudin dosing information, medical comorbidities, and adverse clinical outcomes during administration. 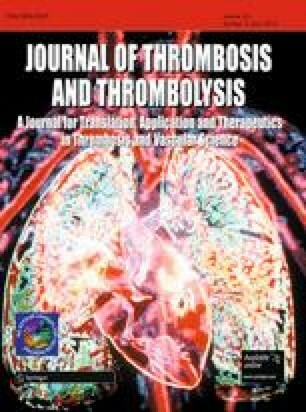 When estimated glomerular filtration rate (eGFR) was calculated by the Cockcroft–Gault (CG; ml/min) formula, the average bivalirudin dose (mg/kg/h) achieving a therapeutic activated partial thromboplastin time (aPTT) was 0.07 ± 0.04, 0.15 ± 0.08, and 0.16 ± 0.07 for patients with eGFR between 15–30, 31–60, and >60, respectively. When eGFR was calculated by the modification of diet in renal disease (MDRD; ml/min/1.73 m2) formula, the average bivalirudin dose achieving a therapeutic aPTT was 0.07 ± 0.04, 0.12 ± 0.07, and 0.20 ± 0.07 for patients with eGFR between 15–30, 31–60, >60, respectively. The difference between the dose achieving a therapeutic aPTT for patients with eGFR >60 when calculated by MDRD versus CG was completely abolished when obese patients were excluded from the CG cohort. The results of our series of patients with renal dysfunction receiving prolonged duration of bivalirudin in the setting of acute coronary syndrome (ACS) suggests that dose adjustment is safe and should be considered for patients with moderate to severe renal impairment (eGFR < 60 ml/min/1.73 m2). We would like to acknowledge the contributions of Dr. Christopher Meduri and Dr. Christopher Huff for their assistance with data collection and obtaining IRB approval.